Demetrius Andrade vs. Jermell Charlo next? Andrade’s start-to-finish mastery had the 10-ranked Nelson on the canvas four times, including an opening round knockdown and the show-stopper at 1:38 of the final round. Andrade, who never lost his belt in the ring, is one step close to his chance at another belt. 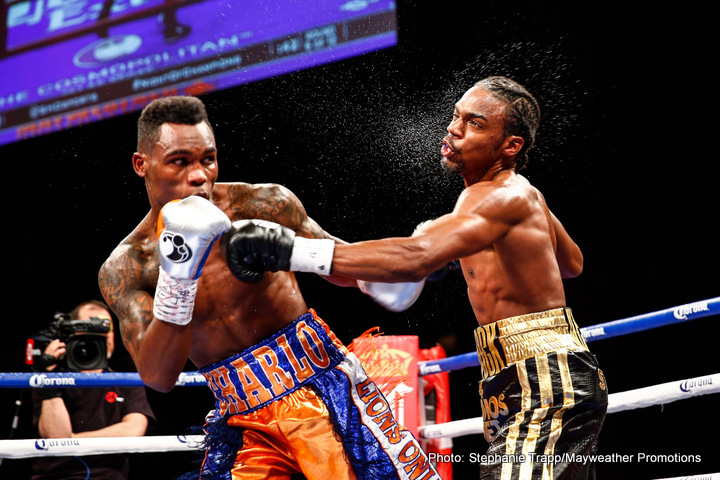 He is the second mandatory challenger for the WBC Super Welterweight championship presently held by Jermell Charlo, or a title fight against twin brother Jermall, who is the IBF champion, is another possibility. Showtime analyst and unofficial ringside judge Steve Farhood had a complete sweep for Andrade before the 12th round TKO. Andrade’s big right hand would inevitably put Nelson away. “He’s the only one landing punches, it’s a shutout,” said Farhood. Andrade put on a clinic with fancy footwork, bobbing and weaving to three-punch combinations, jabs and powerful uppercuts to dominate Nelson from the opening bell. The Providence, Rhode Island native was connecting from every angle imaginable, leaving the experienced Nelson off balance throughout the contest. “I don’t know if anyone can out box this guy,” said former champ Paulie Malignaggi on the Showtime broadcast. In all, Demetrius floored Nelson in the opening round, again at the closing bell of the 11th round, a third time in the 12th round before a big right hook call for the stoppage in spectacular fashion. It was a statement performance. Andrade vs. Nelson was a co-promotion with Joe DeGuardia’s Star Boxing, Banner Promotions, and DiBella Entertainment. Andrade had last fought on October 17 of last year, a TKO victory over Dario Fabian Pucheta at Mohegan Sun, has shown no ring rust. He was idle since June 14, 2014 when he scored another TKO victory over Brian Rose at Barclays Center in Brooklyn in defense of his WBO World Super Welterweight title. Fighting out of his native Providence, R.I., the 28-year-old Andrade has compiled an unblemished record of 23-0 with 15 knockouts since turning professional in 2008 after representing the United States in the 2008 Olympics in Beijing, China. A crafty southpaw with a piston-like jab and knockout power in each hand, Andrade won the vacant WBO Junior Middleweight World Championship with a career-best performance over Vanes Martirosyan on November 9, 2013 and successfully defended the title against No. 1-ranked mandatory challenger Brian Rose. Most recently Andrade, who is a consensus top-5 super welterweight, scored the second-round knockout over Dario Fabian Pucheta. You are here: Home / Boxing News / Demetrius Andrade vs. Jermell Charlo next?